Hopi Kachina dolls are carved, painted and adorned wooden representations of Hopi deities or Kachinas. 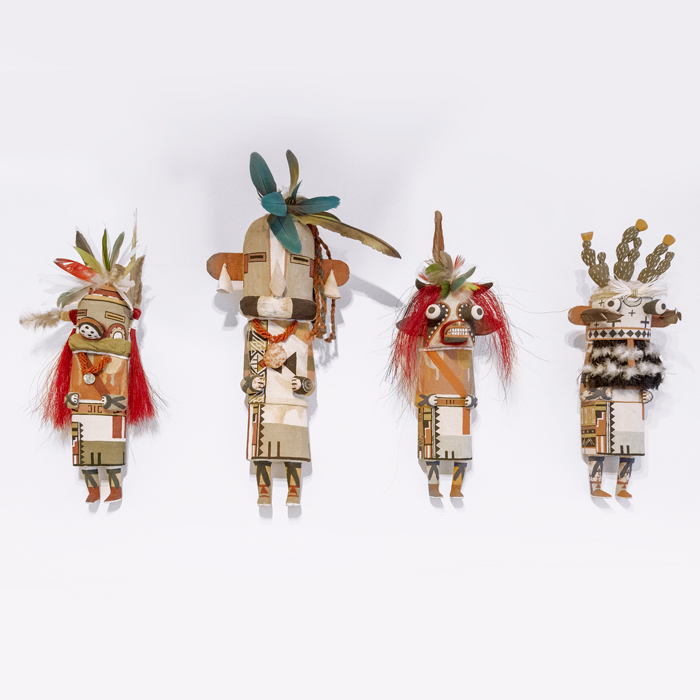 The features of each doll are created to represent specific Kachinas. The dolls are made by uncles as gifts to their young nieces to teach them about the culture and religion of their tribe. Kachina dolls are hung high on the interior walls of Hopi homes. From this traditional practice an art form of stylised Kachina sculptures has arisen. However, I have always been drawn to the traditional style of Kachina doll and I am thrilled to have four very fine dolls in the gallery. They are Pawiki (Duck Kachina), Kuwan Kokopelli (Colourful Kokopelli), Momo (Bumble Bee Kachina) and Sosopa (Cricket Kachina). Each doll is carefully carved and painted by Kevin Honyouti a young Hopi man of the Coyote Clan.